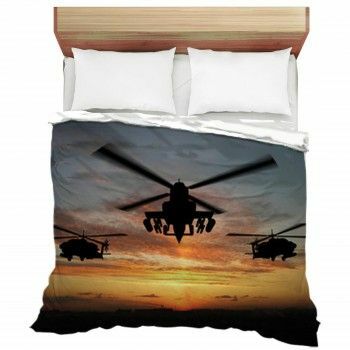 You love home decorating so much that you want to mark each season with its own decor. 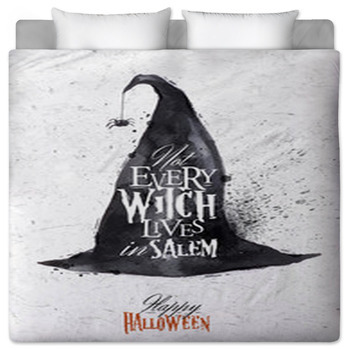 But once your kids get a taste of our Halloween bedding, they'll beg you to let them sleep amid scenes of friendly witches, scary jack-o-lanterns, frightful zombies, mounds of candy, black cats, and haunted houses all year. 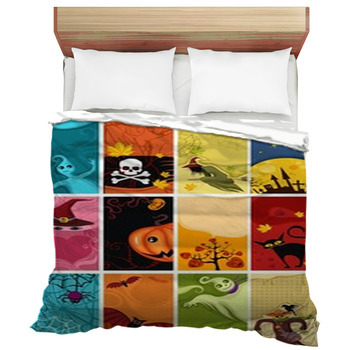 Bring your kids their greatest fantasy with a bed sheet that portrays an illustration of a house made from candy. 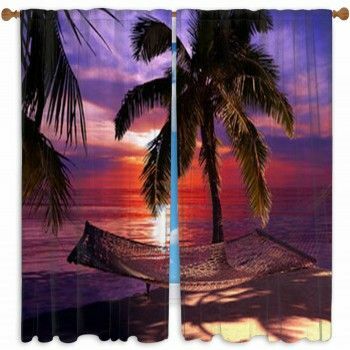 They won't have to ring the door bell and ask for a treat, not when they can simply bite off a chunk of gingerbread wall, chocolate sidewalk, gumdrop walkway or lollipop bush. 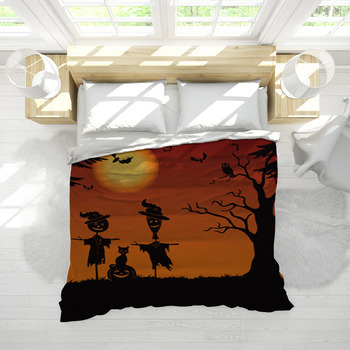 Another Halloween bedding design that is perfect for kids that are too young for frightening themes is shown on our futon covers that feature a black kitten playing with a smiling jack-o-lantern wearing a witch's hat. 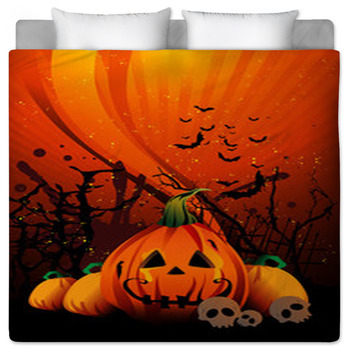 For teens, go with a comforter that brings Halloween horror to the maximum level. 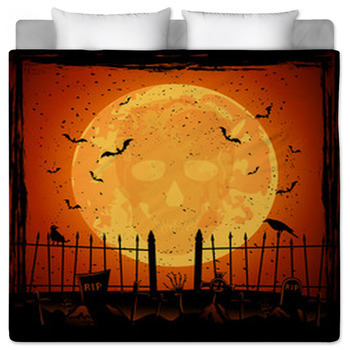 How about a flaming jack-o-lantern with a skeleton body that is also enveloped with orange flames? 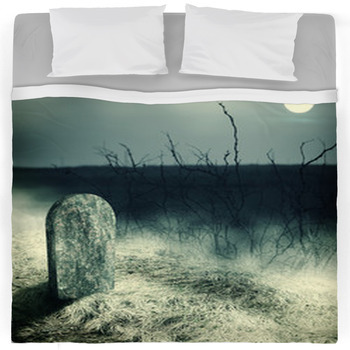 This ghoulish creature is stomping right towards you out of the comforter's black background. 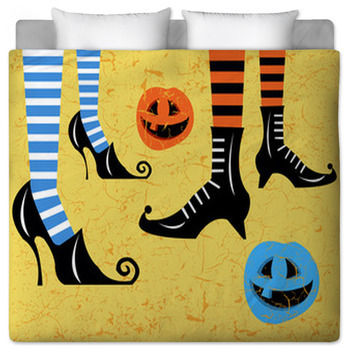 Your teen son loves the cute costumes that girls wear to Halloween parties. 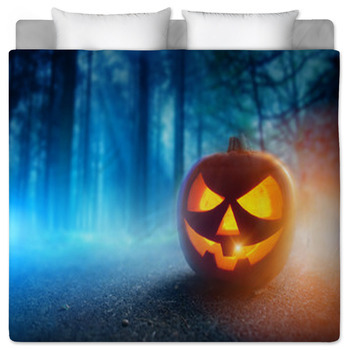 So give him a duvet cover that says Halloween Party beneath a wild scene that includes the black silhouettes of a pair of girls dancing beneath a flying witch, bats and of course a huge full moon. 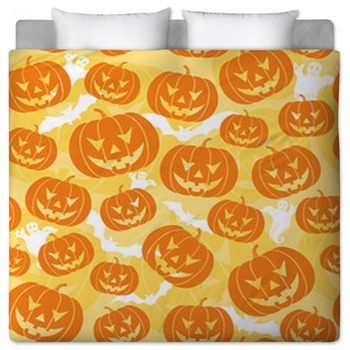 We also have Halloween themed bedding that highlights the most beloved part of this holiday: candy. 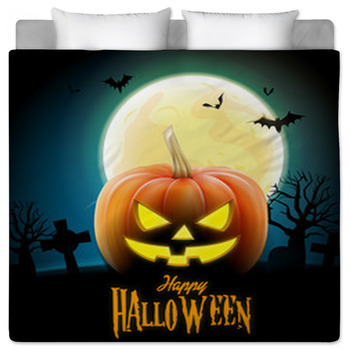 These bed sheets include the candy that's colored with Halloween's own colors, as yellow, orange and white striped candy corn are seen piled from top to bottom. 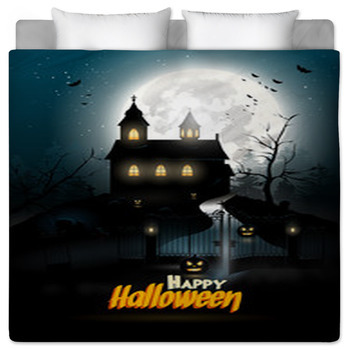 Turn your kid's bedroom into a haunted house with Halloween banners and wall murals.